Once upon a time, on the island of Kaledan, lived a king who was famous all over the East, well-loved by his subjects and respected even by his enemies. In spite of having a good and beautiful wife, his life was not always happy. After years of marriage, they had no children and were afraid they would never know the joy of a family. However, at long last, one splendid spring morning, a handsome baby boy was born and his delighted parents called him Omar. In the language of Kaledan, this means “shining light”. The years went by and Omar grew into a fine-looking youth, brave, intelligent and kind-hearted. On his eighteenth birthday, the king sent for his son. “Father,” said Omar respectfully, “I’ve no intention of getting married. I’m still young and I’d rather wait till the time is ripe. I want to think about it for at least another year.” The king agreed and Omar spent the year studying with the wisest and cleverest teachers in the kingdom. And though he got to know a number of girls, he did not fall in love. When twelve months had passed, the young prince was again summoned to his father. “Alas, father, I still haven’t met the right girl,” was Omar’s reply. The king lost his temper. “I’m sorry, father, I can’t do that just yet. I’m not in love and so I can’t get married.” The king, who could not bear to be crossed in such an important matter, went into a rage. He shouted for the guards and ordered them to shut the prince in an old castle in the forest. In the meantime, lovely sweet-natured Princess Scheherazade was a maiden whose home was in China. When she became sixteen years old, her father insisted she marry one of the princes that flocked to court her. But Scheherazade was waiting to meet a true love. And since nothing the king, her father, did served to change her mind, he locked the princess up in one of the palaces. “Not so!” exclaimed Dhabi. “The most beautiful person in the world is Scheherazade, the King of China’s daughter.” The genies started to argue, then decided to ask Lilibeth, the daughter of the genie king to judge the matter. Lilibeth’s advice was this, “Go to China, cast a sleeping spell over the princess and bring her to Omar’s castle. When you see them together, then you’ll soon see which is the most beautiful.” That very night Abhu and Dhabi flew all the way to China. The two genies sent the princess to sleep and carried her to Omar’s castle. “They’re so lovely, they seem made for each other,” remarked the genies, gazing at the two young people together. “If only they could get to know each other . . .” And in the hope that they might, the genies hid behind a curtain and waited . . .
Not long afterwards, Scheherazade opened her eyes and, when she saw Omar at her side, her heart began to thump. This was the man she would like to marry. So she took off one of her ring and slipped it on to his finger as a token of love. Then she went back to sleep. On awakening a little later, Omar set eyes on Scheherazade and was overwhelmed by her beauty. “If this girl is as kind as she is beautiful, she would make a wonderful wife,” said Omar to himself as he gazed at her in amazement. Then he took off a ruby ring and slipped it onto the princess’s finger. Drowsy again, he fell asleep. Abhu and Dhabi crept out from behind the curtain, wide-eyed. “No, she wasn’t a dream,” the prince insisted. “This is the ring she left me!” Omar was lovesick. The king called doctors and wise men, but there was nothing they could do, for Omar was losing his will to live. And far away, Scheherazade was pining in sorrow. The king was certain his daughter must have dreamt it all. How otherwise could she have met the mysterious young man? The only person who believed the princess was Marzuan, a childhood friend, and he offered to search for the missing youth. Scheherazade handed him Omar’s ruby ring. Marzuan set out that same day but, though he travelled far and wide, no one could give him a clue as to the young man’s identity. In the meantime, Abhu and Dhabi secretly followed in his tracks. One day, a merchant told Marzuan that, on the island of Kaledan, there was a lovesick prince. Feeling that this might be the very person he was seeking, Marzuan took a passage on a ship bound for Kaledan. After days of sailing, a terrible storm broke, driving the ship onto a reef, where it sank. Clinging to a floating spar, Marzuan held on till the storm died away, then headed for the shore. The beach was deserted, but in the distance he could see the turrets of a castle. Then, as he was getting his strength back, he saw a horseman approach. “Where am I?” Marzuan asked the stranger. “On the island of Kaledan,” replied the horseman. “Who are you?” Marzuan jumped to his feet. Disturbed by his words, Marzuan sald, “Take me to him straight away.” When admitted to Omar’s presence, without saying a word, Marzuan showed him the ruby ring. Omar uttered a shriek and leapt to his feet. The onlookers stared in surprise. “This is the ring I gave to the girl I want to marry!” the prince exclaimed joyfully. “That young lady is Scheherazade. She lives in far off China and is dying to see you again,” Marzuan told him instantly. Omar was delighted. In finding the girl of his dreams, he would be truly happy. He presented Marzuan with a jewelled sword and a splendid horse, as fast as the wind, as a token of thanks. Then he told him to take him as quickly as could be to the beautiful princess. Overcoming all the difficulties that it had to face during the long journey, the cheerful procession led by Omar and Marzuan, many days later, reached distant China. When they reached Scheherazade city, Omar announced his arrival by sending a messenger with a letter for the princess and a diamond ring. At long last, the couple had met again. They exchanged their first, affectionate words and found they really were meant for each other. Sure of their feelings and anxious to start a new life together, Omar and Scheherazade quickly asked the king’s permission to get married as soon as possible. The invisible genies, Abhu and Dhabi too, were at the wedding, a few days later. “Scheherazade really is lovely!” Dhabi exclaimed. “Yes, but Omar . . .” said Abhu. “Are you looking for an argument again?” demanded Dhabi. Just then, Lilibeth, the genie king’s daughter appeared. “We still haven’t decided which is the better-looking,” said Abhu and Dhabi. And so the argument finally ended to everybody’s satisfaction, and the two genies hugged each other contentedly. One of the most influential (and most prolific) illustrators of children’s books during the early twentieth century, Edmund Dulac brought countless fairy tales to life through his distinct artistic style, subtle use of color, and fanciful compositions. This archive of masterworks by the renowned illustrator — all reproduced from rare early editions — contains 55 of his most beguiling images. 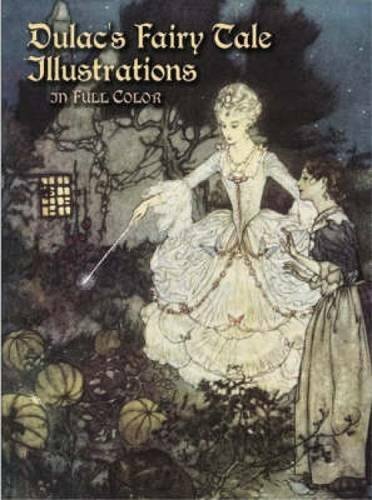 Included are exquisite illustrations for “The Sleeping Beauty,” “Cinderella,” “The Snow Queen,” “The Nightingale,” “Princess Badoura,” “The Real Princess,” “The Mermaid,” and other tales. Certain to delight fairy tale enthusiasts, this lovely collection will be treasured as well by lovers of fine art. Rooted in tales both ancient and modern, these vibrant images date from the early twentieth century’s Golden Age of Illustration. Edmund Dulac, a prominent artist of the period, created them for books published between 1905 and 1928. Their moods range from the shadowy foreboding of Jane Eyre to the venturesome spirits of Treasure Island and the lighthearted fantasies of A Fairy Garland. Other featured titles include Shakespeare’s The Tempest, The Arabian Nights, The Rubáiyát of Omar Khayyam, and the fairy tales of Hans Christian Andersen. French-born Edmund Dulac arrived in London in 1904, when new advances in the printing process kindled a rage for picture books. 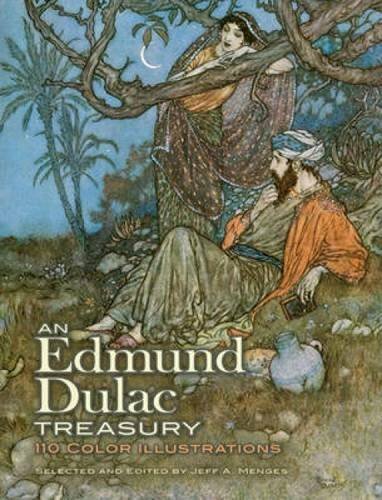 Dulac’s imaginative powers and technical skills assured the popularity of his book illustrations, many of which were sold separately as fine art paintings. After World War I, when the appetite for deluxe volumes waned, the artist turned his talents in many new directions, including portraiture, theatrical costume and set design, newspaper caricature, and stamp design. This retrospective of his early works is the only such anthology available, offering a singular tribute to an artist from a halcyon era of art inspired by literature. Now as sumptuously packaged as they are critically acclaimed―a new deluxe trade paperback edition of the beloved stories. The stories of ?The Arabian Nights ? (and stories within stories, and stories within stories within stories) are famously told by the Princess Shahrazad, under the threat of death should the king lose interest in her tale. 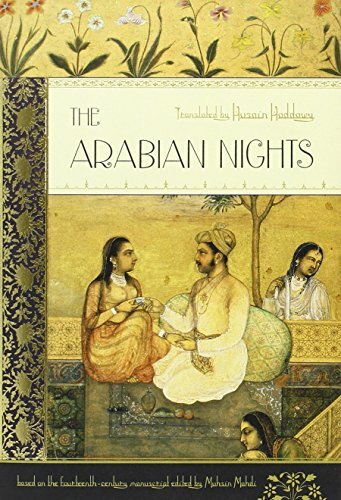 Collected over the centuries from India, Persia, and Arabia, and ranging from adventure fantasies, vivacious erotica, and animal fables, to pointed Sufi tales, these stories provided the daily entertainment of the medieval Islamic world at the height of its glory. No one knows exactly when a given story originated, and many circulated orally for centuries before being written down; but in the process of telling and retelling, they were modified to reflect the general life and customs of the Arab society that adapted them―a distinctive synthesis that marks the cultural and artistic history of Islam. This translation is of the complete text of the Mahdi edition, the definitive Arabic edition of a fourteenth-century Syrian manuscript, which is the oldest surviving version of the tales and considered to be the most authentic. Nikolai Rimsky-Korsakov (1844–1908) was a prolific composer of orchestral works and many other forms of music, including chamber works and art songs. He also wrote many operas, excerpts from which are featured in this collection. Contents include the famous orchestral interlude The Flight of the Bumblebee as well as the suite from The Tale of Tsar Saltan. 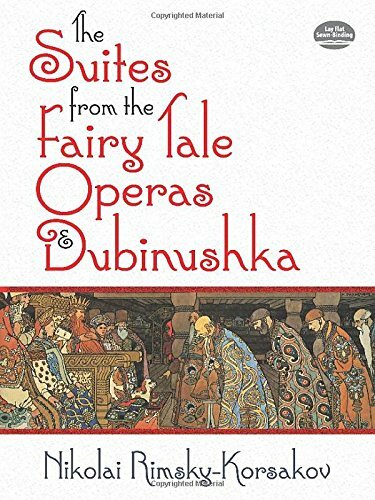 This fanciful opera was based on Aleksandr Pushkin’s poem, “The Tale of Tsar Saltan, of His Son the Renowned and Mighty Bogatyr Prince Gvidon Saltanovich and of the Beautiful Princess-Swan.” Additional selections include the suite from another work inspired by Pushkin’s poetry, The Golden Cockerel, a controversial satire of the disastrous effects of the tsarist regime. Nikolai Gogol’s Evenings on a Farm Near Dikanka served as the basis for Christmas Eve, a tale of magical doings on Christmas Eve. The final suite is Dubinushka, Op. 62, a work rooted in a song the composer overheard protesters singing during the 1905 revolution. Musicians and music lovers will appreciate this inexpensive collection of popular works, all reproduced from authoritative sources.